Custom woodwork makes rooms warmer and lends them a timeless style. 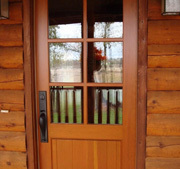 Combine custom woodwork with a remodeling service for a complete redesign. Williams de la Roca designs custom woodwork in Madison and surrounding Dane County. Since the firm's start in custom furniture, it has expanded to offer design and installation of custom wood features for any part of the home—kitchen, bathroom, dining room, entertainment or leisure area, basement, and bedroom. Professional service from an experienced craftsman. As owner and lead designer, Don Williams meets all facets of business with a professionalism that builds confidence in his capabilities before the first design is drafted. Williams de la Roca offers clients a personalized approach to design and construction, with Mr. Williams seeing each project through to a successful end alongside a network of talented custom woodworkers. Extensive experience working alongside homeowners, builders, architects and interior designers makes for service well-suited to a variety of client relationships, all of which are given the respect and attention they deserve. You have a vision. We have the passion and the skill. The first mark of a Williams de la Roca design is quality. Aside from excellent craftsmanship, Williams custom woodwork is marked by your overall satisfaction—from the finished product to your experience as a Williams de la Roca customer. We are passionate about the natural beauty and design flexibility of wood, whether kitchen cabinets, dining room sets, fireplace mantles, or library shelving. Nearly any wood feature you envision can be tailored to suit your style. Serving Dane County, Madison, Middleton, Verona, Fitchburg, Waunakee, Monona, & Stoughton, WI.